I will start this story with the experience of my friend and neighbor Yami. I hope she won't mind writing about her, but I'm sure if I offer her ''tea time'' she will forgive me almost anything! LOL. 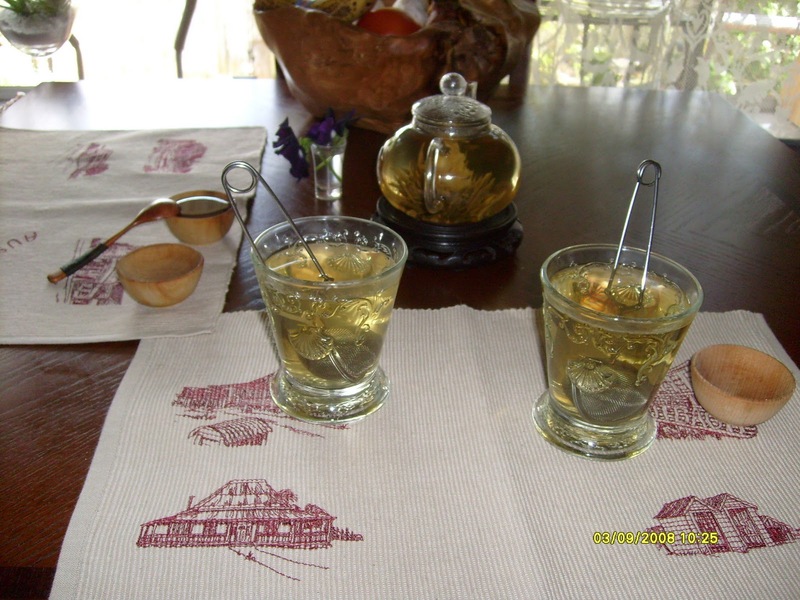 She helped me discover a talent I didn't know I had.....making Tea Time into Healing Time. I did always enjoy good tea in beautiful aesthetic tea ware, but I didn't know how truly powerful and transformational it was until she explained it's effects upon her, which I was soon to see. Then I understood better the effects I've had on other people who I thought were just being complimentary. I knew I have medicinal healing abilities, but I didn't know they transferred so well into simply serving tea and food with such love. I had returned from a 3 month trip to Australia when I came back to a humid and unpleasant state of affairs in my gardens. Everything I had planted had died. It took me 3 days to get up from being depressed to face it and when I had gone out with a warrior's determination to fix it all in 2 days, there she came up to say hello to me, and told me her news. Separation with divorce pending. Her sadness was palpable. My heart went out and she had my full attentions. I invited her again to my kitchen to have some tea or something to eat, and after 7 years she decided to take me up on it. 1 or 2 days later she did, and then began the magical journey of transformation and healing for her and the discovery of the uncompromising power of Earth's medicines, love and attention. The true magic lies in the depth of power and how the healing and transformation radiates out to all involved. Firstly, Yami, was not a ''tea'' person AT ALL. If anything she enjoyed coffee but tea was that dried out little black bag that came in a box from the grocer, and which was thrown into a cup with hot water. This is NOT tea in my world. If one is to enjoy life, including daily chores, they can be transformed into acts of mindful meditation when you do them with love and things of beauty. The Japanese excel at this, and I learned from them well.....in another life. I have beautiful individual size glass tea pots. I love the fact that the glass allows you to watch the transformation of tea buds and flowers open up to reveal a much larger ''Green", and how the water changes colors and how the leaves and flowers float.....and then you can drink this elixir. I bought some ''flowering teas'' which is a meditation in itself. So my appreciation grew with the love of those tea makers and for them. I bought some glass pots, pretty bowls, wooden trays.....all things to make the Tea Time a Thing of Joy and Beauty......as one of the Tuatha De Danann would. I also bought some exotic blends and more flowering teas and have fun mixing them with others to make wonderful tasting blends for different moods. One of the best medicine's for me, and it turned out for Yami as well, is the Orange Blossom. I will have her write out her experience of her discovery so I can move on with my story here, but how she/we discovered her Orange Blossom as a dear friend is quite amazing. I soon had to make her a perfume of Orange Blossom or Neroli, as well from my Neroli Essential Oil which was brought for me from Paris and it is divine.....!..., which also became her ''anti anxiety'' medicine, as it has been mine. Yami came over and I invited her into my kitchen on the new high table by the window overlooking the Salad and Shade Gardens. It was also then that "Serena's Garden Cafe" came into being. I asked her if she wanted tea, and she, completely unaware of what was about to transpire, literally, as she says, a change of life, she accepted for lack of anything else, :D seemingly the polite thing to do when one visits, is to accept water, juice or the teabag. The ambient music playing low and soothing. We especially enjoy Bliss's CD "Quiet Letters" . I began moving about the kitchen and bringing out the pots, the servers, asking which kind of glass she prefers drinking from, the wooden spoons, the flowers, the honey and soon there was a ritual and a celebration unfolding.....like the petals of a flower opening in the sun. I had pulled out the choices and let her sniff them, and she chose the Orange Blossom, by Rishi..... and this one is a heavenly blend of green tea, organic lemongrass, org. osthmanthus flowers, org lemon myrtle, natural essential oils of orange, lime and tangerine....a truly blissful combination. I serve it with organic Orange Blossom Local Honey. Tea served, she with her own pot and honey bowl and spoons, and me with mine. The inhalation of testing, first sips were taken......then approval...... from the Soul,. She was sighing deeply.....and had a perplexed look upon her face as if for the first time listening to something deeper speak silently to her. She listened and felt it......and down went the Elixir of Orange Blossoms to soothe my friends' broken heart........ and the magic began. 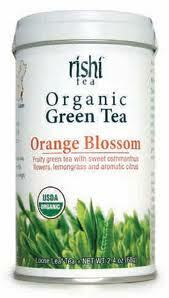 Tea on its way......Flowering tea in pot, Orange Blossom in individual strainer. In this pic the entire tea serving was not yet out. I will soon take more pics of teas as we enjoy them. I also have an individual flower for my guest as well. Here one can barely see a deep purple pansy which faces her. By the end of her visit she was not feeling so bad, she seemed to have strength and conviction and the ability to move around in her world efficiently. I soon saw Yami again, and then more often, then daily....and we discovered we truly liked each other, laughed a great deal, and simply enjoyed every moment together. I always have some wonderful Tea and food to serve and we enjoy it not simply for food's sake, but because when one enters my home, it is time for magical transformation of anything less than love and I intend that all will be healed. I love doing it, it is medicine for everyone's soul. It works like a charm every time. We are healed together, lighter, stronger and able to face the mundane world. I joke that it took a tragedy in her life to finally cross the 50 feet to my home and discover the friendship we so now loved! She agrees! But she also admits she would never had taken Tea if she were not so depressed lol.... and would have missed out on that World of Earth's Medicine's! It was perfect timing. Tea time is so important, it is critical for Communion with one's own Soul and those of other's. It is a sacred bridge for traveling to anothers inner space to be with them, in them, and to have them be in you for a time. It is indispensable for us, taking in the Green Life of Mother Earth of which we too are made, through her herbs, flowers and grasses, in delightful combinations, to transform one into a better being. as much as i like the look of your page, the opaque white background, with its green leaves picture behind confuses the words written on top in green font. Can you do something about it? Love reading so many things that you have written.. they remind me of something familiar , as if from a distant past, yet i dont know what..